Sulfolobus solfataricus N-terminus and other regions of the partial amino acid sequence of a thermoprotein exhibiting poly(ADP-ribose) polymerase activity suggest that it belongs to the DINGGG class of proteins that are often described as membrane bound. Our previous biochemical studies demonstrated that the thermoprotein is also strictly associated with DNA, and is only partially solubilized from cell homogenate. The present research is focused on the analysis of the sulfolobal DING thermozyme localization within the archaeal cell. Immunofluorescence microscopy evidenced the peripheral cell localization of Sulfolobal DING protein, along the plasma membrane hedge. Less intense, but clearly occurring, is the merge of Sulfolobus poly (ADP-ribose) polymerase with nucleoid. Anti-poly(ADP-ribose) polymerase immunoblottings clearly showed the occurrence of Sulfolobus thermozyme in membrane fractions as well as they confirmed its association with nucleoid DNA. Fluorescent anti-PARP-1 antibodies showed that the PARPSso immunosignal localizes close to the membrane, at the periphery of cell, and that PARPSso green signal is also overlapping or strictly close to the nucleoid. Biochemical analyses confirmed that the thermozyme occurs in both membrane and nucleoid preparations. DING proteins (38–40 kDa) are ubiquitous, characterized by a conserved N-terminal sequence, DINGGG . First identified in several animal and plant tissues, and then in most eukaryotes and bacteria , at present the DING family includes about thirty members that are usually secreted, although some are found in the cytosol [2, 3]. Several plant DING proteins are known, one of which, p27SJ, was isolated and cloned from St. John’s Wort (Hypericum perforatum) and has wide pharmacological properties [2, 3]. Despite the common ability to bind phosphate, their roles are not yet clear . No complete gene sequences coding these proteins have been identified in any of the eukaryotic genome databases and only for a prokaryotic DING protein, from P. fluorescens SBW25 , the gene, PfluDING, has been cloned and expressed in Escherichia coli . Despite this unresolved question, the complete amino acid sequence of the DING human phosphate-binding protein (HPBP), isolated from human plasma as an apolipoprotein, was identified  and was demonstrated to be involved in protection against atherosclerosis and viral infection [5–7]. Recently, a phosphatase with a typical DING N-terminal sequence has been identified in the thermophilic bacterium Thermus thermophilus . This protein interacts with the cell membrane, has a molecular weight of 40 kDa and exhibits optimal phosphatase activity at 70 °C. It is a multifunctional enzyme with ATPase, endonuclease and 3′-phosphodiesterase activities; moreover, it binds to linear dsDNA, displays helicase activities and could thus be involved in DNA repair . In our laboratory, a DING protein was identified in Sulfolobus solfataricus. Such enzyme is the first example of a DING protein in Archaea, and this finding extends the existence of DINGGG proteins into all the biological kingdoms . This thermoprotein, called PARPSso, had been previously characterized as a poly-ADP-ribose polymerase (PARP)-like enzyme . Similarly to eukaryotic nuclear PARPs, PARPSso binds DNA with high affinity , elongates the ADP-ribose chain to synthesize oligomers in both automodification and heteromodification reactions and cross-reacts with anti-PARP1 antibodies [12, 13]. Poly(ADP-ribosyl)ation reaction is a widespread post-translational and reversible modification of proteins catalysed by the family of NAD+ ADP-ribosyl transferases, known as poly(ADP-ribose) polymerases (PARPs), and is involved in a number of cell functions [14, 15]. Two PARP family members, nuclear PARP1 and PARP2, were found to be activated in response to DNA damage and are mainly involved in DNA repair [15–17]. Recently, the partial amino acid sequence of PARPSso was identified and clearly indicated that N-terminus and its tryptic peptides (about 60 % of total residues) do not share structural similarity with any of the known PARPs, but resemble those of DING family proteins . It contains the characteristic DING N-terminal sequence and phosphate-binding site residues ; nevertheless, it exhibits biochemical properties of a DNA-bound ADP-ribosylating enzyme. The aim of this work was to address the question of PARPSso localization within the sulfolobal cell. Interactions of the thermozyme with DNA and membrane lipids were investigated. The results demonstrated that PARPSso localizes close to both membrane and nucleoid. 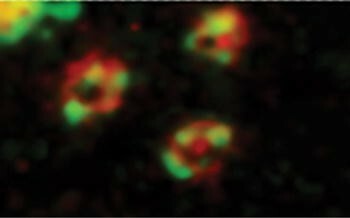 The intracellular localization of PARPSso and its relationship with cell components was investigated by fluorescence microscopy. In these experiments, we used S. solfataricus cells, fixed with 100 % methanol. DNA, membranes, and PARPSso were stained specifically with DAPI, FM64, and fluorescent anti-PARP-1 antibodies, respectively (Fig. 1). The fluorescent anti-PARP-1 staining outlines the perimeter of the S. solfataricus cells (Fig. 1a, bottom left; green), as does the membrane staining (Fig. 1a, top, right; red), while the DAPI-stained DNA is located in the cell centre (Fig. 1a, top middle; blue). The merged images of the anti-PARP-1 (green) and the membrane staining (red) (Fig. 1a, bottom left) suggest co-localisation of PARPSso with membrane components. On the other hand, a co-localisation, even lower, was observed for the merged image of the DAPI-stained DNA (blue) and anti-PARP-1 (green), (Fig. 1a, bottom middle panel). This image indicated that PARPSso establishes interactions with the nucleoid too. In particular, the green/blue merge is more evident in the cell at top of figure (right hand), and in the cell at bottom (right hand). In the latter, nucleoid is strictly close to fluorescence. For comparison, Fig. 1b, c shows the results of a positive (human A375 melanoma cells) and a negative (E. coli cells) control, respectively. In the positive control, merge of DAPI (blue) and anti-PARP-1 antibodies (green) overlap in the centre of the cell (nucleus), consistent with the nuclear localization of PARP1 in eukaryotic cells (Fig. 1b). On the other hand, no fluorescence at all was evidenced in E.coli cells, where PARP is not present (Fig. 1c). Cell lysate was prepared according to a previously described procedure . Considering that PARPSso interacts with endogenous DNA and that the enzyme is better solubilized from the cell lysate by DNase/RNase A treatment , a DNase digestion step was performed after cell lysis by sonication. In the experiment described here, following a procedure reported for membrane protein extraction, the lysate was used to separate the soluble fraction, expected to contain PARPSso interacting with DNA, from the insoluble one, corresponding to membranes . After early incubation with nuclease, enzyme activity was measured to calculate the recovery of the enzyme (data not shown). Nearly, 50 % activity was solubilized in the cytoplasmic fraction (FC); 41 % PARPSso activity was distributed almost equally between membrane integral protein fraction (FI, 21 %) and the residual pellet P (19 %, highly insoluble membrane proteins). Figure 2 shows the electrophoretic patterns of anti-PARP immunoblotting and DNA results of these fractions. Anti-PARP immunoblotting gave evidence of a main band at a molecular weight nearly double (between 51 and 86 kDa markers) than the 46.5 kDa corresponding to the monomeric PARPSso, consistent with the dimeric form of the thermozyme previously identified (Fig. 2b) . A very faint band was visible at the molecular weight of 46.5 kDa for PARPSso (arrow). Despite DNase digestion and detergent treatment in the final step, most PARPSso remained associated with the most insoluble fractions (pellet P and fraction FI), which contained the intrinsic membrane proteins. The same amount of total protein (20 μg) for each fraction was electrophoresed on agarose gel to analyse the DNA distribution. In the cell lysate (L), most DNA was at top of the gel, Fig. 2c. After centrifugation, the smallest and most soluble fragments, likely produced by DNase digestion, were found in the cytoplasmic fraction. In the pellet P, a long highly fluorescent smear at the same size as the band in FI extended towards the bottom of the gel, with a strong fluorescent band localized in the well, Fig. 2c. The results indicated that, although the experimental procedure was suitable for membrane protein (i.e. highly insoluble) extraction, an amount of large-sized DNA remained associated with the insoluble material, mainly with pellet P.
In order to study whether this distribution could depend on sample manipulation and to tentatively separate potentially soluble PARPSso and DNA, the pellet P (highly insoluble fraction) was subjected to organic extraction with n-butanol [20, 21]. According to the protocol from the reference papers, we expected to find all of the DNA in the aqueous phase, proteins at the interface, and membrane lipids in the organic one. Figure 2d shows that PARPSso was present in all phases in similar amounts. Additionally, although aqueous and interphase contained most of the large-sized DNA that migrated into the gel, a very intense nucleic acid staining remained in the well in the butanol fraction (Fig. 2e). In order to confirm that this nucleic acid was in fact DNA, analysis of small aliquots of each sample by agarose electrophoresis after digestion with pancreatic DNase I showed a reduction, or disappearance of bands, above 500 bp in size (data not shown). The presence of both PARPSso and DNA in the organic phase, which corresponds a weak protein pattern to (data not shown), suggests a very tight association of DNA and enzyme with apolar molecules (perhaps membrane lipids?). PARPSso localization was further characterized by fractionation of the archaeon membrane-free nucleoid by ultracentrifugation on a sucrose discontinuous gradient . This method rapidly sediments DNA–protein complexes and the nucleoid, leaving other soluble and lighter cell components at the top of the gradient. DNA and protein's content of the gradient fractions were monitored by absorbance at 260 and 280 nm, respectively, and their profiles were found to almost overlap, with high absorbance peaks corresponding to low sucrose percent, followed by an intermediate region with low absorbance at both wavelengths and an increase of absorbance towards the bottom of the gradient (Fig. 3a). Gradient fractions of equivalent absorbance were pooled (R0 to R7 in the figure), dried and used for electrophoretic analyses. The same results were reproduced in other two such experiments on two different cell preparations where the fractions were not pooled and were used separately for the following experiments (data not shown). SDS-PAGE and anti-PARP-1 immunoblotting showed PARPSso immunobands (Fig. 3b). DNA content of gradient fractions was analysed on agarose (0.7 %) gel (Fig. 3c). In R7 (50 % sucrose, bottom of the gradient), DNA gave a net band corresponding to large-sized standards and a weak staining in the well (Fig. 3c). The latter was also present in fraction R6. These large-sized DNA fragments were associated with the most intense immunobands of PARPSso (Fig. 3b). The present work aimed to define the relationship of PARPSso, the first archaeal member of the DING protein class to be identified, with cell components (nucleoid and membrane), and its intracellular distribution. The association of the thermozyme with DNA was widely demonstrated in the past . A still unsolved point was that the different purification protocols used failed to recover all of the PARPSso activity assayed in the cell lysate. Indeed, in the present paper, we provide evidence that the enzyme activity is almost equally distributed between cytoplasm, containing also DNA, and membrane-bound proteins. The presence of PARPSso in the cytoplasm was expected as it is strictly associated with DNA . Besides this localization, anti-PARP immunoblottings clearly showed that PARPSso occurred in various membrane (FE, FI and P) fractions. Moreover, most of large-sized DNA was found in association with membrane intrinsic proteins (FI). Even n-butanol treatment, commonly used to separate DNA from the organic phase, was not sufficient to extract into the aqueous phase the remaining part of both DNA and PARPSso which were still occurring in the highly insoluble pellet (P). The possibility that their presence in the n-butanol phase could be a contamination problem is unlikely after several steps of extraction under different conditions. At least these results indicate that despite drastic extraction conditions, some DNA and PARPSso are still insoluble. Fluorescent anti-PARP-1 antibodies clearly showed that the PARPSso immunosignal is along the membrane, at the periphery of the cell; however, it remains close enough to nucleoid position to be connected with the DNA too. It is known that S. solfataricus nucleoid occupies a large part of the interior of the cells in the stationary phase . Despite lacking the compartmentalization of eukaryotes, a spatial organization of nucleic acid processes exists in prokaryotic cells too. Recent data suggest that this spatial organization contributes to the temporal regulation of DNA and RNA . Moreover, in S. solfataricus, some membrane proteins without transmembrane domains were found in the insoluble/membrane fractions, including enzymes involved in DNA replication . It is known that in sulfolobal cells the exosome, an RNA-processing protein complex is membrane bound, and since the membrane is involved in the spatial organization of the nucleic acid plays an important role in RNA maturation . These data fit with the peripheral localization of PARPSso and its strict association with both DNA and membrane lipids. As with the exosome proteins, PARPSso is localized along the periphery of the cell, although it is strictly associated with DNA and thought to be involved in nucleic acid metabolic processes [11, 12]. A such behaviour was described for the multifunctional DING enzyme from Thermus thermophilus that is membrane bound and also exhibits activities within the DNA repair process . These multiple biological activities in the same enzyme occur frequently. It is not unusual that prokaryotic proteins are multifunctional and can be employed to regulate different metabolic events; they are reported as promiscuous enzymes [28, 29]. Whether the interaction of PARPSso with both DNA and the membrane occurs solely for spatial organization or means that PARPSso is involved in various processes is an important question to be addressed by future work. Purified pancreatic RNase and DNAase I (EC 3.1.21.1), phenylmethyl sulphonyl fluoride (PMSF), protease inhibitors, were obtained from SIGMA Chemical Company (Milano, Italy). Electrophoretic protein markers were purchased from BioRad (Italy). Electrophoretic DNA markers were purchased from MBI Thermo Scientific Fermentas (Italy). Primary antibodies (anti-PARP1 catalytic site) were from Santa Cruz Biotechnology (California, USA). Sulfolobus solfataricus (strain MT-4, DSM No. 5833) cells were grown at 87 °C (pH 3.5) and collected at stationary phase . Cells underwent the procedure described in , with some modifications. All solutions contained 1 mM PMSF and a cocktail of protease inhibitors (2 μg/mL; SIGMA). Briefly, cells (wet weight) were lysed in 20 mM Tris–HCl buffer, pH 7.5 (buffer A), containing 100 mM NaCl, 100 mM MgCl2 (1:3, w/v), by sonication (8 times, 15 s on at 8 mm amplitude; 45 s off). Lysed cells were treated with both DNase and RNase as described in . Low-speed centrifugation (2000g, 5 min) precipitated debris and heavy material, followed by further centrifugation of the supernatant at 100,000g for 75 min at 4 °C. The collected supernatant corresponded to the soluble cytoplasmic fraction. The pellet (membrane fraction) was suspended in 20 mM sodium acetate buffer, pH 5.0/1 M NaCl and centrifuged again as described above for 1 h. The supernatant contained high salt solubilized membrane extrinsic proteins. The new pellet was dissolved in buffer A (100 mM NaCl, and 0.4 % v/v TRITON X-100) and centrifuged. A supernatant containing intrinsic membrane proteins, and a highly insoluble pellet were obtained. The latter was analysed after suspension in 50 mM Tris–HCl, pH 7.5 (8 mL), or after further treatment with 2-butanol to separate any residual soluble material (DNA and proteins) from lipids [20, 21]. 2-butanol extraction is often used to remove from aqueous solutions water and hydrophobic molecules, but not DNA or solute molecules. Protein concentration was determined according to . Most techniques and protocols used for PARPSso analysis in this and the following sections are detailed in . The nucleoid from S. solfataricus cells was isolated by a procedure described for S. acidocaldarius  with some modifications. Harvested cells (0.3 g, stationary phase) were suspended in 10 mM Tris–HCl, pH 7.5 (buffer B), 100 mM NaCl (1 mL), and were lysed in buffer B, containing 1 % Nonidet P-40, 2 mM spermindine-HCl, 10 mM Na2EDTA, a cocktail of protease inhibitors (2 μg/mL), 1 mM PMSF (final volume 1 mL), and incubated at 10 °C for 30 min. All following solutions contained 10 mM Na2EDTA. The lysate was centrifuged at 1000g for 5 min. The clear viscous lysate was mixed with 10 % sucrose (final 5 %) and layered onto a 15–50 % sucrose discontinuous gradient in buffer B, with 3 mM MgCl2, 1 mM PMSF before centrifugation at 10,000g for 16 h. Suspension of the cell lysate in 5 % sucrose (final) before layering onto 15–50 % sucrose gradient was introduced to avoid or reduce trapping of heavy material (nucleoid) on the top. One mL fractions were collected from the top of the gradient, and their absorbance was measured at 260 and 280 nm in a Cary 1 spectrophotometer (Varian). The gradient fractions were pooled, dialyzed against water and analysed by both SDS-PAGE and agarose gel electrophoresis. Details of procedures are in . Briefly, proteins were analysed on 12 % polyacrylamide slab gels in the buffer system 24.8 mM Tris—192 mM glycine in the presence of 0.1 % SDS and electrotransferred onto PolyVinyliDene Fluoride (PVDF) membrane (Bio Rad) at 200 mA for 2 h at 4 °C, in the same buffer used for the electrophoretic run with 0.025 % SDS. Gels were stained in 0.1 % Coomassie R-250, 10 % acetic acid, and 10 % ethanol. Silver staining was performed according to . For immunoblot experiments, PVDF sheets were treated for 1.5 h with the blocking solution, TBST (50 mM Tris–HCl, pH 8.0, 150 mM NaCl, and 0.5 %, v/v, Tween 20), and 3 % (w/v) gelatine. Incubation with primary antibodies (anti-PARP1 catalytic site, Santa Cruz; dilution 1: 1000, v/v) was in the same solution supplemented with 0.3 % gelatine for 2 h at room temperature, RT . After several washes in TBST buffer and incubation for 1 h at RT, antibody binding was detected by using horseradish peroxidase (HRP)-conjugated secondary antibody, at RT. The HRP reaction was revealed by using a kit for chemiluminescence (Super Signal West Dura Extended Substrate, 34075, PIERCE) and measured by a phosphor imager (Biorad). The fractions derived from the different extraction procedures were suspended in Loading Dye Solution (LDS, MBI Fermentas) and loaded on a 1 % w/v agarose gel, in TAE buffer (40 mM Tris, 0.1 % v/v acetic acid, 1 mM EDTA), electrophoresed at 100 V, stained with ethidium bromide (0.5 μg/mL) and fluorescence detected on a UV transilluminator. 0.01 % Bromo Phenol Blue (BPB) was added to the sample buffer to monitor migration time . ADP-ribosylating activity of crude and purified PARPSso was assayed at 80 °C in the presence of 0.64 mM [32P]NAD+ (10,000 cpm/nmol) according to . Automodification reaction was monitored by precipitating proteins from the reaction mixture (50 μL with ice-cold 20 % TCA, freed of NAD+ by several 10 % TCA washes). The radioactive acid-insoluble material was collected on a HAWP (0.45 μm, Millipore) filter and radioactivity measured in a Beckman LS 1701 liquid scintillation spectrometer. One enzymatic milliunit was defined as the enzyme activity catalysing the incorporation of 1 nmol ADP-ribose into acid-insoluble material at 80 °C per minute. Fresh stationary phase sulfolobal cells were fixed with 10 % methanol, suspended in 10 mM Tris–HCl buffer, pH 8.0 with Proteinase K (20 μg/mL) and incubated at room temperature for 10 min to permeabilize cell wall . The permeabilized cells were suspended in PBS containing 2 % bovine serum albumin (BSA) and incubated with anti-PARP1 catalytic site antibodies (Santa Cruz, 1:50, v/v) overnight at 4 °C. After washing with PBS, the cells were incubated with the secondary antibody (Alexa Fluor 488 goat anti-rabbit IgG; Invitrogen, 1:200, v/v, in PBS) for 1 h, followed by several washings in PBS. Human A 375 melanoma cells were fixed with 4 % formaldehyde, permeabilized with 0.5 % Triton, and analysed as above. Live cells were stained with 4′,6′-diaminidino-2-phenylindole (DAPI, 0.2 μg/mL, Molecular Probes), and FM 64 (5 μg/mL; Molecular Probes) for DNA and membrane detection, respectively . Microscopy images were acquired with an Olympus BX51 microscope with a 100x UPlanF1 and U-WIBA filter, and captured by analysis (SIS) software. The present work aimed to define the relationship of PARPSso, the first archaeal member of the DING protein class to be identified, with cell components (nucleoid and membrane), and its intracellular distribution. Indeed, in the present paper, due to the use of new extraction conditions that discriminate between cytoplasmic and membrane proteins, we provide evidence that the enzyme activity is distributed by 50 % between cytoplasmic and membrane-bound proteins. In particular, anti-PARP immunoblottings clearly showed the occurrence of PARPSso in the most insoluble membrane fractions. Fluorescent anti-PARP-1 antibodies highlighted that the PARPSso immunosignal is along the membrane, at the periphery of cell; however, it remains close enough to nucleoid position to be connected with the DNA too. EP carried out fluorescence microscopy, membrane and nucleoid preparations and all related analyses (enzyme assays, immunoblottings, etc.). ARB carried out some protein and DNA electrophoreses of nucleoid fractions. RI and LB gave technical support in fluorescence microscopy. MRFM contributed to conception and design of the experiments, gave interpretation of data, and drafted the manuscript. All authors read and approved the final manuscript. We wish to thank Servizio Fermentazioni, (ICB, CNR, Pozzuli, Naples) and Dr. Barbara Nicolaus (ICB, CNR, Pozzuli, Naples) for providing cells of Sulfolobus solfataricus. We are grateful to Dr. Anna De Maio, Department of Biology (Naples), for providing melanoma A375 cells.